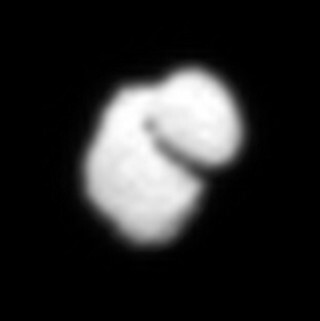 The European Space Agency’s Rosetta spacecraft photographed Comet Churyumov-Gerasimenko/67P from a distance of about 12,000 km using its Onboard Scientific Imaging System (OSIRIS). This image has been enhanced with interpolated data. The Rosetta spacecraft is expected to further study Comet Churyumov-Gerasimenko/67P and in an unprecedented event for scientific study, eventually land on the comet in August 2014. These adn future observations and analysis by Rosetta will help scientists learn more about the origin and evolution of our solar system and the role comets have played.